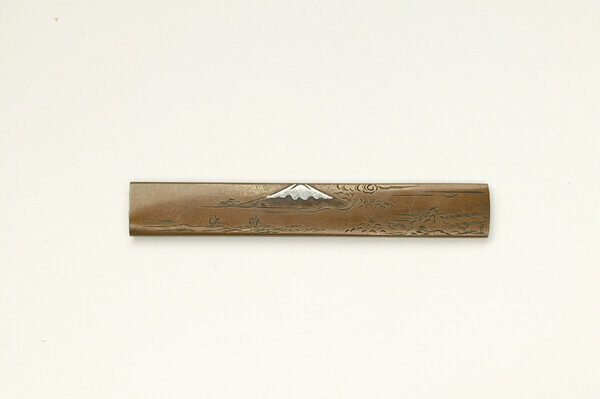 Both of these kozuka are thick solid material, not plated. that's about all I can tell you about them. 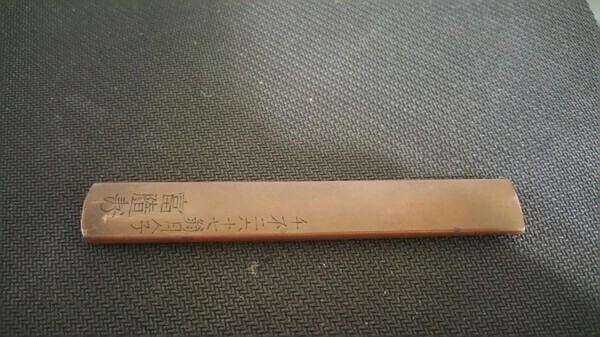 The spine of the copper one says 千四百五. aka 1405. Which I believe the signature is supposed to be from a guy named 齋藤富隨 or Saito Fuzui? Looks right to me, except I would like to see a better close up of the spine. 千四百五 may well be correct, but it is unusual. It would not be a date - so it is odd (for me) to see a seemingly random number like this. 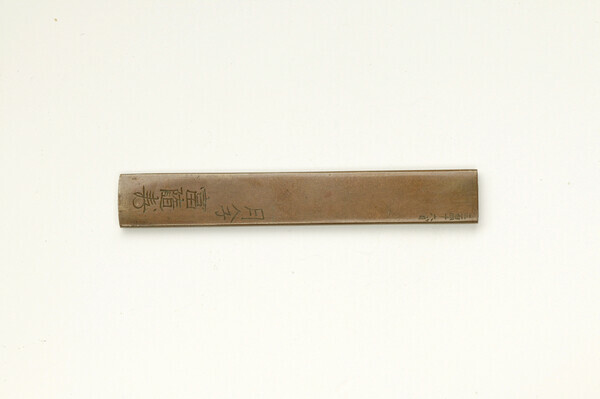 The name Fuzui is ended at the bottom with a personalized Kao 花押 mark. The last one looks like iron, with gold and silver zogan inlay. 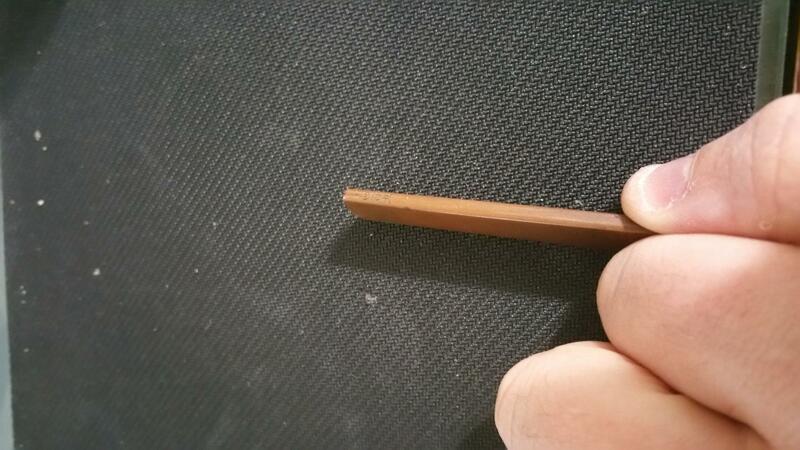 Yeah last one is inlaid iron. Mumei. Any idea on the school/period? 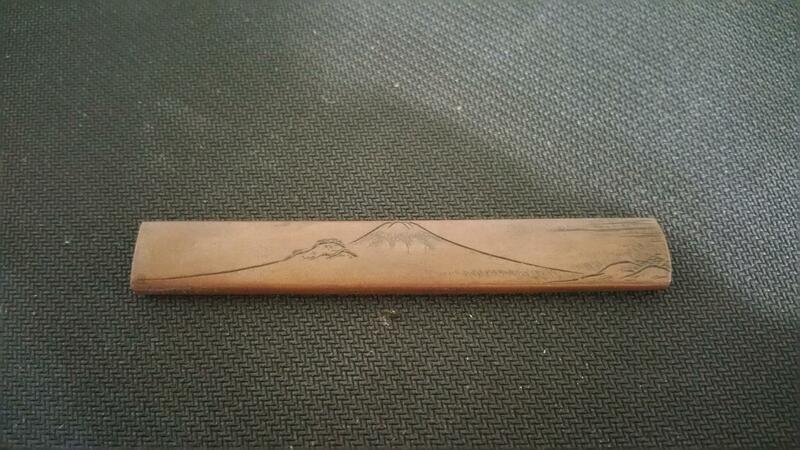 Isn't that one of the 100 views of mt fuji? Any further insight on these? It depends on what you know already. You asked for help, but how much do you want? In your first post you said: "Both of these kozuka are thick solid material, not plated. that's about all I can tell you about them." Then you mentioned that you knew one was copper. So I told you the other was probably iron, but you then said: "Yeah last one is inlaid iron. Mumei." This made me feel stupid. If you already knew that it was iron, why ask, and why not give the information that you already knew? So now, if I add anything more, you might well say that you already knew that, so I am not really feeling generous any more. Lol sorry man, didnt mean to make you feel bad. your help is appreciated. Didn't know about the kao mark, i was trying to figure that kanji out for ages lol. But yeah any info on time period, maker, or school would help. For real? Should I have this sent to kantei? This is making me think it may be more important than I was assuming it was. I have 346, with a match for the signature, if my memory serves me right. When was this guy active? What school?